Can anyone recommend video editing software, free and easy is best , all I want to do is clip footage and add comment with in a box and may be highlight things spotted. I'm running windows and Windows video editor does not quite do what I want. 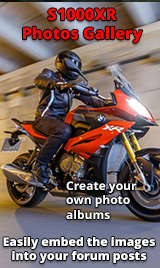 Topics in the "S1000XR - General Discussion section" must in some be S1000XR related. Moved to "Time Out - General Chat"
Check out DaVinci Resolve by Black Magic Design. For a long time this was a very expensive software that is used extensively in Hollywood. Recently they made it free - HOWEVER, the free version only supports 1080 resolution or lower (which is fine for most). If you want more than that, it's going to cost you ~$1000. If you've every used Final Cut Pro on Macs, it's very similar. If you are new to video editing, it may be a bit intimidating as it was designed for professionals but it's not too hard to figure out - especially if you've used other video editors. For laughs, check out their related hardware...up to $30k for an editing panel. I use Pinnacle Studio for video editing. Not free, but not really expensive either, and seems to do pretty much everything an amateur might need. Great idea for the DaVinci Resolve! I was collecting my clips and wondering if I start to pay the Adobe fee and so on, but this one will save me that money while allowing me to do the relative basic video editing I do for my clips!